Musings on project management: What's the value? Book or Good Will? But, when the accounting industry figured out that most businesses are worth a lot more than their salvage value, even more than the market value of tangible assets -- like inventory, buildings, and tools -- the accounants had to invent an asset and terminology to cover the gap. It even sounds like it belongs in a business. Who doesn't want good will? So, now we to come to projects -- why else write this stuff? Surely not to push a book! In my book, Managing Project Value, I have a chapter on "value attainment" -- Chapter 9, actually. Here's an illustration that makes my point. Thus, the "book value" will change over the course of the project. In the beginnng, book value is zero; everything about the project is good will since all of the to-be actual cost is still sitting in other assets -- like cash, and all the to-be business benefits are unrealized. But time moves along; the project gets completed. At the post-project operations moment, what do we have? Tangibly, we have all the artifacts of the project -- deliverables, tooling, intellectual property. We can put their cost down as the book value of the project. That's what OPM -- other people's money -- bought in the near term. 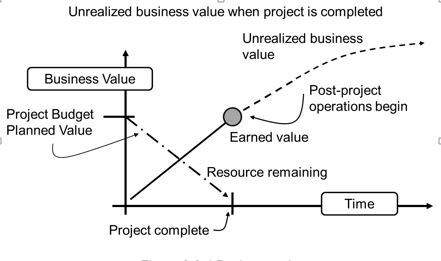 But, the real intent of the OPM investment is the (far term) business value ... which is initially all good will, even at project finish, but ultimately turns real with product success. So, if that's the intent, what's the PM role in realizing that intent? Near-term: it's all about the utility of book value -- getting to DONE or complete with the assets assigned.